Hi y'all. LeeAnn McKinney here, one of the Inspirational Compadres at Laura's Loft. 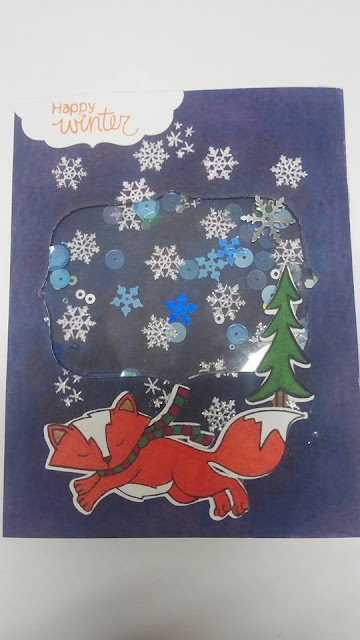 With winter showing its face in a lot of the world, and many locations having snow, thought I would post today with a fun shaker card I have made using a couple of products found at Laura's Loft. First thing I did was use the stamp set and Versafine to stamp out the fox and tree on a Panel of Neenah Bright White. I then took the Tim Holtz Watercolor paper and stamped out snowflakes with versamark ink and using my heat tool embossed them using Ranger white embossing powder. Once complete I used various colors of distress inks to create the night sky scene, including Chipped Sapphire, Peacock Feathers, Dusty Concord and Faded Jeans. I then used my project life die to cut out the area for the shaker card, and used the ATG to mount that to the card base front. After applying atg to the back of the card front, I affixed a sheet of acetate a little larger than the cut out; and then applied Scotch foam tape to that. After adding some Baby Its Cold* sequin mix I affixed the card front to the base. Using my Spectrum Noir and Bic Mark-its to get the desired colors, I took to the fun little fox frolicking through the snow, and the pine tree he is running past. I then affixed these to the front of the card. After completing all this I added a few sequin snowflakes from the Baby Its Cold* mix to the font with Tombow multi mono adhesive. I hope you have enjoyed this project, and I am seriously going to try to start taking photo's throughout the process in the future, I don't seem to think about it until the card is finished.